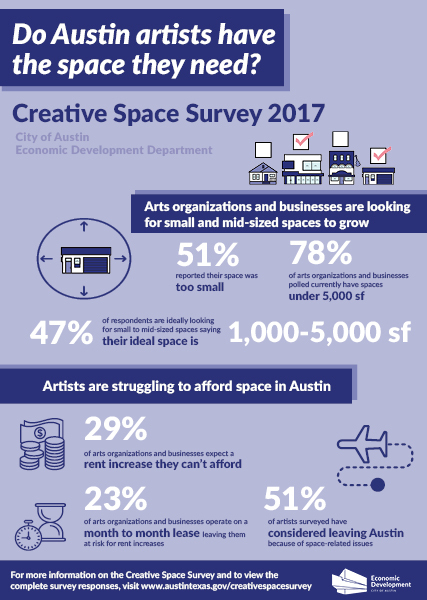 The Creative Space Survey is your platform to share your needs for creative space with the City of Austin. Conducted annually by the Economic Development Department, the Creative Space Survey asks artists, arts organizations and businesses to share their space needs, preferences, and ideal costs. The information you share below allows Economic Development to keep pace with changing needs within our creative sector and directly informs department efforts for addressing affordability for local creatives such as creative space incentives, district designation, and creative space matchmaking efforts with partner organizations. The data you submit not only helps City staff develop new strategies, but is also available to the public and provides arts organizations with concrete information to support advocacy efforts and funding requests. Take the 10 minute survey below to tell us what kind of space you need to keep you creating! Click here for results from the Artists Survey and here for the Organizations and Businessess Survey.